What does your hallway say about you? 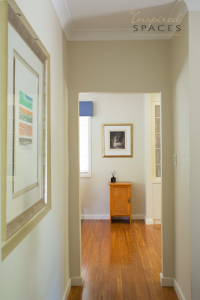 First Impressions count and as the hallway is the first thing your guests see it’s important to make the space warm and inviting so it speaks positively about how you live. Unfortunately it’s an area we overlook and 9 times out of 10 it’s used as a dumping ground for mail, jackets and shoes. This may be partly because we feel it’s not a proper room, and as it’s usually an awkward space being long and narrow it can be hard to decorate. How to transform your hallway your own way? 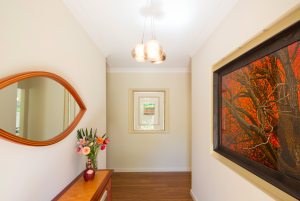 This blog will give you some useful tips to help transform your hallway from a neglected area to a bright and welcoming space. Hallways are often dark so make sure there is adequate lighting. Take advantage of any natural light through hallway windows by removing heavy curtains and replacing them with sheer blinds. If privacy is an issue, consider replacing clear glass with acid-etched or frosted glass panes that will let the light through but also offer some privacy. Also, position mirrors to reflect the sun’s rays. For the main artificial lighting source, consider a large modern pendant or chandelier hanging from the centre of the hallway. Hallways are all about ambience so adding in key lighting to the entranceway will create a welcoming atmosphere. If the hallway still looks too dark I suggest adding a table or stand lamp with a low-wattage globe. First, keep hallways streamlined by removing any clutter to give guests some breathing space when they arrive. Secondly see what’s left to store. Look in investing in hooks, shelving or tubs to help free up the space. If possible reposition storage further down the hall to free up entrance space. A cool idea is to install a floor-to-ceiling shelving unit this will break up the narrow horizontal space by adding in vertical lines. Here magazines, books and decorative items can be organised and displayed on the shelves. To add something extra to the space an umbrella stand is always a nice touch. Bear in mind storage doesn’t have to be boxes or trays – vintage bowls mugs or trays can be placed to in convenient locations to throw in keys and any extra small bobs. 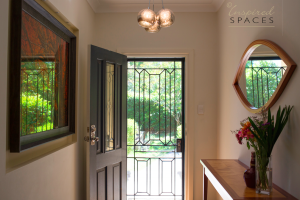 If you want to provide a sense of calmness on entry the paint colour that you choose should blend in with the rest of the house. A warm neutral such as Dulux Hogbristle, quarter or half strength is a good choice for a light and welcoming feel. If you want to add some drama to the space don’t be afraid to add some colour. A long dark hallway will benefit with a brightly painted door or some funky wallpaper. If you don’t want to commit to painting an entire wall in a bold shade, paint furniture items instead even a funky patterned floor runner could help to maintain the energetic, playful vibe. Hallways are known be difficult to decorate but adding in simple items such as a mirror, sculpture or a living plant can work wonders to the space. A decorative focal point will distract from any imperfections. Enliven long sight lines with a fabulous pop art welcome mat or unique object. If you have space concentrate personalising it with an interesting piece of furniture, such as an old armchair or console table. If your hallway is tight consider decorating the the walls instead. Hang a beautifully-framed mirror or create a family photo gallery. And don’t forget the front door. It’s the very first thing visitors see, and it’s easy to improve. A fresh coat of paint, some smart house numbers and attractive hardware will all transform your entrance. 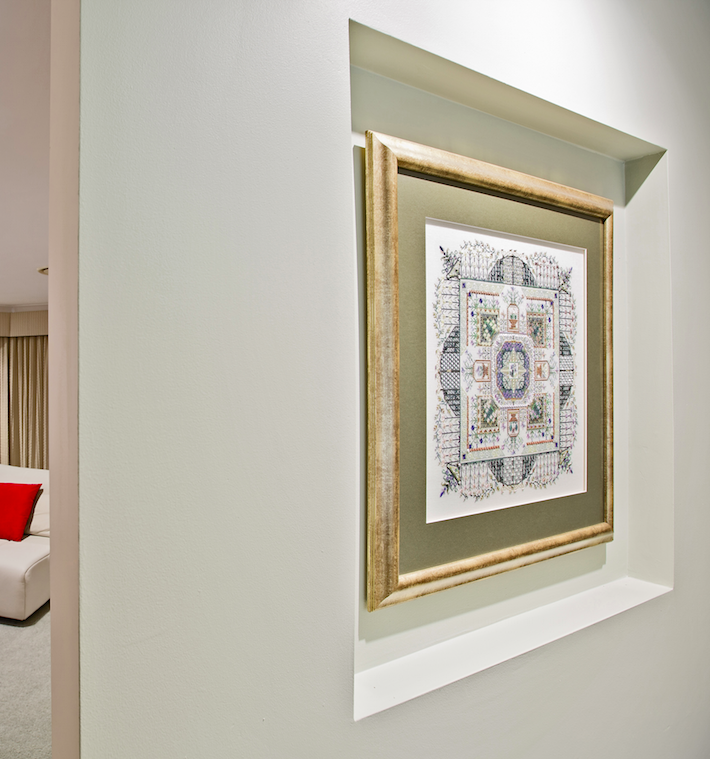 If you don’t have a hallway in your property then use the ideas above to create one in your entrance room. A console with flowers and art over is all that you need.